Wanted by the authorities, a small-time thief reunites with a hip American journalism student and attempts to persuade her to run away with him to Italy. Part of the Criterion On Hulu film club. On Fridays, we cover films that are free to non-subscribers; click here to vote for this Friday's film. Next Monday: The Stranger (Agantuk), the last film from master director Satyajit Ray. Hulu subscribers can stream it here. Wow, I wanted to get some context for what this movie meant at the time it came out. Check out the NY Times review: sordid is really a mild word for its pile-up of gross indecencies. Jean Seberg is captivating in this movie. She has an insane amount of charisma. As an aside, I just saw the new Black Panthers documentary this weekend. They rightly focus on the immediate targets of FBI counter-intellegence attacks on Black Panthers themselves, and didn't mention Seberg's death, but I'm remembering now that some attribute her suicide to the FBI's smear campaign against her for her support of the Panthers. I love that Bosley Crowther review from the Times, he makes it sound like A Clockwork Orange, the next decade must have been tough for him. I understand this movie's contribution to cinema, but other than being enchanted by Seberg it just wasn't to my taste. I'm like four movies behind for the club, and it's all because I'm stalled out hard on this movie. I think I only have 30 minutes left in it, but every time I sit down to finish it I end up watching whatever fall TV Hulu puts in front of me. This feels almost shameful to suggest, but between this, Pickpocket, and a few other films, is it possible I just don't like the French new wave? I appreciate its place in film history, but all the individual films just feel so…adolescent, in one way or another. I do like French New Wave, and I do like Godard, but every single time I watch a Godard movie, which has been many times now, I am like, "huh, whaaatt..., why?" the entire time. I don't exactly "like" his movies, but I feel compelled to keep watching them. I know...I don't want to be that tiresome friend who is contrarian about everything. Besides, I already don't care for most Kubrick films, Vertigo, and the 70s Golden Age Of Movies About Immigrants Yelling At Their Wives...my film contrarianism dance card is full up! I think I'm going to dial back on the Friday Free films for the next little bit...I, too, am buying a house, and while I'm not getting married (congrats! ), this is the 15-hour-workdays season at my job. The original idea of the Friday films was to bring in non-subscribers, because I felt a little iffy having a Club that was only for people who paid a subscription fee every month. We've had some good discussions about the films, but we haven't exactly seen an influx of folks who watched that week's film because it was free on Hulu. I hadn't thought about skipping any weeks in the main club, but now that you bring it up, in two weeks our queue runs out, so maybe we'll let the club take a break for holidays, moving into new houses, weddings, movies in English made in the last 30 years, etc. When we get closer, I'll float the idea a more relevant thread. To make this remotely about the film in question: I was consistently cracked up by the main character's cigarettes: loosely rolled, apparently filled with grass clippings and sawdust, the size of a tween's index finger. 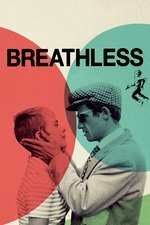 And then it hit me: that's why the film is called Breathless! Except that the original title is À bout de souffle, which I think means A Fight About Souffle, so there goes that theory. A Fight About Souffle: my new chapbook! I'm don't mind being behind on club movies, since it's not the first time for me. I can't say I don't like French New Wave categorically. I really liked Cleo and… that's about it. Looking over the list, I can't say I'd be excited to watch any of the rest. I restarted the film and watched it straight through last night. Once I got past my initial stumbling block (the interminable scene with Michel in bed while Patricia flits around her apartment) I started appreciating the film as a portrait of a smart, self-possessed young woman who nevertheless gets in over head with a good-looking deadbeat. I'm curious about Michel, though: how do you guys think he was supposed to be perceived when the film was released? Seen in 2015, to me anyway, he's the worst decision Patricia has made but little more than 1960 Paris' answer to 30 Rock's Dennis Duffy. But when the film was released, was he supposed to be...cool? An antihero? A rebel against bourgeois morality? A parody of the film noir heroes he apparently reveres? I didn't get the sense that his character was supposed to be transgressive or meta in a Natural Born Killers way, like Godard was saying "you like bad boys, eh? Here's the ultimate bad boy...he just straight-up murders people!" But maybe that's what he was going for? I liked Belmondo's performance even if I didn't like his character. He did a great job selling my interpretation of Michel as a loser whose self-image as a ice-cold outlaw leads him to destruction. And you have to give him credit for dedication to the shoot: that painful bellyflop onto the pavement at the end was perfect. I'm also curious about the press conference with the pretentious proto-MRA author. Are we supposed to think he's cool? I wouldn't even ask, but Patricia seems pretty taken by him. Though, upon reflection, maybe that's another illustration of her terrible taste in men: that awful journalist she meets with, Michel, this guy, etc. PATRICIA: Qu'est ce qu'il a dit? VITAL: Il a dit que vous êtes vraiment "une dégueulasse". PATRICIA: Qu'est-ce que c'est "dégueulasse"? PATRICIA: What did he say? VITAL: He said, "You're a real scumbag". MICHEL: Makes me want to puke. VITAL: He said you make him want to puke. PATRICIA: What's that mean, "puke"? Finally, I kept expecting the two of them to run into Cleo as they dashed through the streets. The Nouvelle Vague Cinematic Universe!